Nyjah Huston has emerged as a defining force in skateboarding’s progression in our current era. Since he joined Nike SB at the start of 2016, the countdown started to when we would see a signature Nyjah shoe with the swoosh on it. The wait is over. 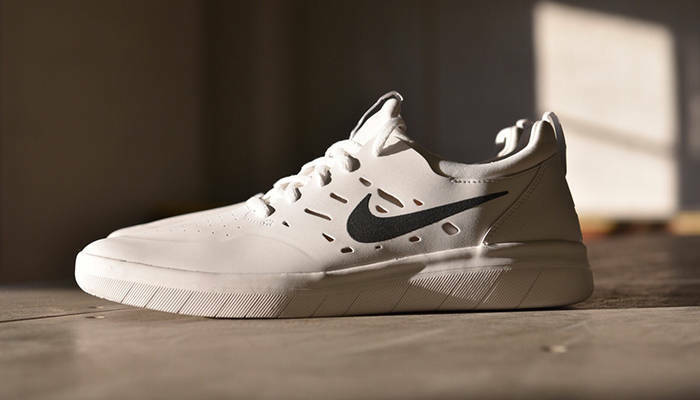 Huston’s first Nike SB shoe draws inspiration from the Nike Free and Air Presto silhouettes, and will be available on March 1 for $95 USD. And, as mentioned in our Ty Evans interview on Monday, Nyjah will be releasing a part to coincide with this release that is filmed and edited by Evans. Have a look at the shoe above. ATTACK THE BLOCK — A Four-Way Ledge S.K.A.T.E. This is what happens when a friendly game of S.K.A.T.E. develops more of an edge. Cole, Gustavo, Fynn, and Tucker really know the ledge. In honor of the release of his raw tapes on Theories of Atlantis, we caught up with Jeremy Elkin for an exclusive interview. Get to know filmmaker Reed Morano, as featured in Berrics Magazine, issue #1. Thunder comes through with some new Chris Miller footage.